Don’t say, “Oh, Lord, I suffer from wandering thoughts.” Don’t suffer from wandering thoughts. Chambers rails against our “individual natural lives.” But these lives, flaws and all, are what we’re given to work with. We put them in God’s hands and offer them up, but to reject them or suggest they can merely be pushed aside like a bowl of cold oatmeal is absurd. Scrupulously trying to deny the wandering thoughts that occur naturally in prayer in the surest route to failure. We need to glance at them, acknowledge them, perhaps even contemplate them to understand why they are distracting us, and then gently return our minds to the task at hand. Only the most spiritually advanced can ever really find their way into the Cloud of Unknowing, which means the rest of us need to work with what we’ve got. We strive towards mastery of our thoughts in prayer through awareness and discipline, not denial. Man is embodied soul. Our bodies, our thoughts, our individuality: these are not an unfortunate side effect of creation and the fall, but an integral part of our being. Chambers writes that we need to be “delivered” from our individuality, but this is getting things the wrong way around. We conform ourselves to God, we don’t smash ourselves apart upon Him like waves broken and dissipated on rocks. The practice is not to sit there trying to have no thoughts or only certain thoughts. 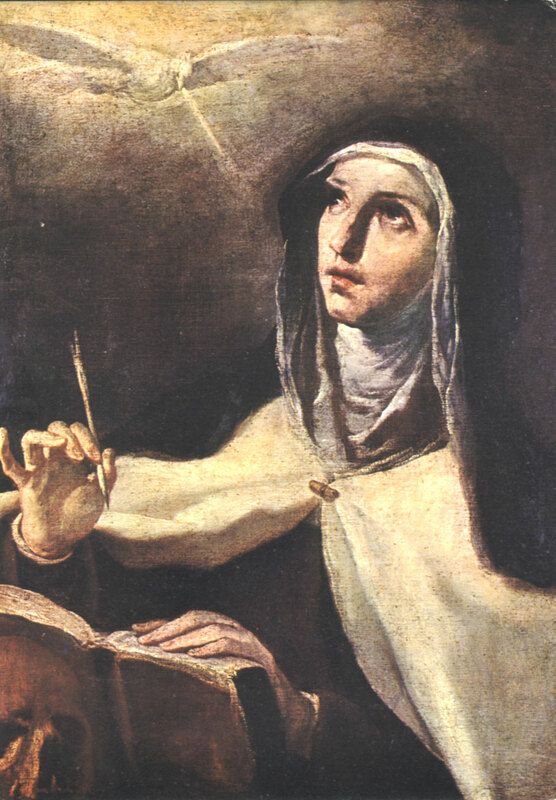 As St. Teresa of Avila put it centuries ago, “by trying not to think, we hopelessly stimulate the imagination…. The harder you try not to think of anything, the more aroused your mind will become and you will think even more.” Nor do we push away thoughts in an attempt to generate a dull blankness. Instead we simply bring our attention back to our practice whenever we find that our attention has been stolen. The challenge lies in its simplicity. The practice of bringing the attention back time and again creates what is called a habitus or habit, an interior momentum that gradually excavates the present moment, revealing over time the stillness that is within us all like a buried treasure. His Majesty wishes us to learn by ordinary means to understand ourselves and to recognize the share taken in these troubles by our wandering imagination, our nature, and the devil’s temptations, instead of laying all the blame on our souls. You are not the only one who is troubled with wandering thoughts. Our mind is extremely roving. But the will is mistress of all our faculties. She must recall our stray thoughts and carry them to God as their final end. If the mind is not sufficiently controlled and disciplined at our first engaging in devotion, it contracts certain bad habits of wandering and dissipation. These are difficult to overcome. The mind can draw us, even against our will, to worldly things. I believe one remedy for this is to humbly confess our faults and beg God’s mercy and help. I do not advise you to use multiplicity of words in prayer. Many words and long discourses are often the occasions of wandering. Hold yourself in prayer before God, like a dumb or paralytic beggar at a rich man’s gate. Let it be your business to keep your mind in the presence of the Lord. If your mind sometimes wanders and withdraws itself from Him, do not become upset. Trouble and disquiet serve rather to distract the mind than to re-collect it. The will must bring it back in tranquillity. If you persevere in this manner, God will have pity on you. As Laird observes, we can learn from the way Jesus responded to the temptations of the Devil: with a short line of scripture. When distracted, a brief line from the Bible (I find the Jesus Prayer most effective) can short circuit the distraction and bring our thoughts back on track. The thing is not to deny the distraction–which is “Don’t think of a pink elephant” impossibility–but to cultivate techniques for coping with them when they occur. Because they will occur, and just saying “don’t”–or “stop it!”–won’t change that.